Libby, B. (2011). Considering graffiti's rise in Portland and the nation. Portland Architecture. Tarantino, A. (2013) Portland Street Art: A Visual Time Capsule Beyond Graffiti. Createspace. Oleksiak, Meltzer, and Dunitz. 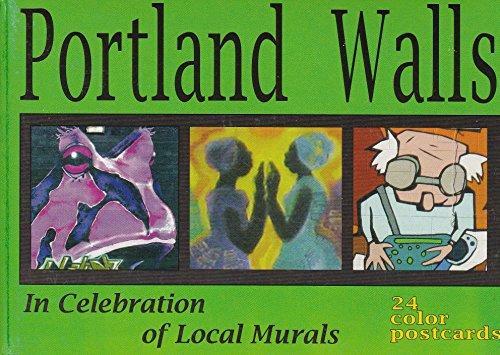 (2009) Portland Walls: A Celebration of Local Murals. RJD Enterprises. Moscato, M. (2011) Walls of Pride: A Tour of African American Public Art in Portland. The Dill Pickle Club. Austin, J. (2001). Taking the Train. New York: Columbia University Press. Brighenti, A. (2010). At the Wall: Graffiti Writers, Urban Territoriality, and the Public Domain. Space and Culture, 13(3), 315-332. Brook, I. (2007). Aesthetic Aspects of Unauthorized Environmental Interventions. Ethics, Place and Environment, 10(3), 307-318. Carrington, V. (2009). I Write, Therefore I am: Texts in the City. Visual Communication, Los Angeles: Sage Publications. Castleman, C. (1984). Getting Up: Subway Graffiti in New York. Cambridge, MA: MIT Press. Chmielewska, E. (2007). Framing [con] text: Graffiti and Place. Space and Culture, 10(2), 145-169.
Cooper, M. & Chalfant, H. (1984). Subway Art. New York: Henry Holt and Company. Conklin, T. (2012). Street Art, Ideology, and Public Space. (Masters Thesis, Department of Urban Studies and Planning Portland State University 2012). Cresswell, T. (1992). The Crucial Where of Graffiti, A Geographical Analysis of Reactions to Graffiti in New York. Environment & Planning D: Society & Space, 10, 329-344. Deitch, J. (2010). Art in the Streets. New York: Skira Rizzoli Publications. Dickens, L. (2008). Placing Post-graffiti: the Journey of the Peckham Rock. Cultural Geographies, 15(4), 471-96. Dickens, L. (2008). Finders Keepers: Performing the Street, the Gallery and the Spaces In-between. Liminalities: A Journal of Performance Studies, 4(1), 1-30. Dickens, L. (2009). The Geographies of Post-Graffiti: Art Worlds, Cultural Economy and the City (Doctoral Dissertation, Department of Geography at Royal Holloway University of London 2009). Dovey, K., S. Wollan, & I. Woodcock. (2012). Placing Graffiti: Creating and Contesting Character in Inner-city Melbourne. Journal of Urban Design, 17(1), 21-41. Ferrell, J. (1993). Crimes of Style: Urban Graffiti and the Politics of Criminality. Current Issues in Criminal Justice 2. New York: Garland. Gomez, M. (1993). The writing on our walls: Finding solutions through distinguishing graffiti art from graffiti vandalism. Journal of Law Reform, 26, 6333-6707. Goode, R. (2007). The Politics of Pasting: A Spatial Inquiry into the Practice(s) of Wheatpasting, Power, and Representation. (Master‘s Thesis, California State University, Department of Geography). Gorsek, C. (2004). The Effect of Informal Social Control on the Presence and Geographic Distribution of Graffiti on City Streets. (Doctoral Dissertation, Portland State University, Department of Urban Studies and Planning). Gottlieb, L. (2008). Graffiti Art Styles: a Classification System and Theoretical Analysis. Günes, S. & G. Yýlmaz. (2006). Understanding Graffiti in the built Environment: The case in Ankara, Turkey. Case Study presented on the ISOCARP Congress 2006: Cities between Integration and Disintegration. Jefferson, NC: McFarland. Halsey, M. & A. Young. (2006). Our Desires are Ungovernable: Writing Graffiti in Urban Space. Theoretical Criminology, 10(3), 275-299. Iveson, K. (2010) The Wars on Graffiti and the New Military Urbanism. City, (14)1-2, 115-134. Jakob, K. (2008). Street Art in Berlin. Berlin: Jaron. MacDonald, N. (2001). The Graffiti Subculture. New York: Palgrave Macmillan. MacPhee, J. (2004). Stencil Pirates: A Global Study of the Street Stencil. Brooklyn NY: Sof Skull Press. McGaw, J. (2008). Complex Relationships between Détournement and Recuperation in Melbourne‘s Street (Graffiti and Stencil) Art Scene. Architectural Theory Review, 13(2), 222-239. Orengo, H., & D. Robinson. (2008). Contemporary Engagements Within Corridors of the Past: Temporal Elasticity, Graffiti and the Materiality of St Rock Street, Barcelona. Journal of Material Culture, 13(3), 267-86. Pasternak, A., (2010). Just Do It. In E. Seno (Ed. ), Trespass: A History of Uncommissioned Urban Art. China: Taschen. Rahn, J. (2001). Painting without Permission. Basingstoke: Palgrave. Riviere, M. (2005). The Dynamics of a Canvas: Graffiti and Aerosol Art. Public Art Review, 17(33), 24-27. Schacter, R. (2008). An Ethnography of Iconoclash. Journal of Material Culture, 13(1), 35-61. Schlecht, N. (1995). Resistance and Appropriation in Brazil: How the Media and Official Culture Institutionalized Paulo‘s Grafite. Studies in Latin American Popular Culture, 14, 37-67. Taylor, M., R. Cordin, & J. Njiru. (2010). A Twenty-first Century Graffiti Classification System: A Typological Tool for Prioritizing Graffiti Removal. Crime Prevention and Community Safety, 12(3), 137-155. White, R. (2000). Graffiti, crime prevention and cultural space. Current Issues in Criminal Justice, 12, 253-266. Bonnett, A. (1992). Art, Ideology, and Everyday Space: Subversive Tendencies from Dada to Postmodernism, Environment and Planning D. Society and Space, 10, 69-86. Borden, I. (1996). Beneath the Pavement, the Beach: Skateboarding, Architecture and the Urban Dream. In I. Borden (Ed. ), Strangely Familiar: Narratives of Architecture in the City (pp. 82-86). London: Routledge. Cresswell, T. (1996). In Place/out of Place: Geography, Ideology, and Transgression. Minneapolis: University of Minnesota. Debord, G. (1957). Report on the Construction of Situations. In K. Knapp (Ed. ), Situationist International Anthology. Berkeley, CA: Bureau of Public Secrets. Hou, J. (2010). Insurgent Public Space: Guerilla Urbanism and the Remaking of Contemporary Cities. New York: Routledge. Kingwell, M., & P. Turmel. (2009). Rites of Way: the Politics and Poetics of Public Space. Waterloo, Ont. : Wilfrid Laurier UP. Kwon, M. (2002). One Place after Another: Site-Specific Art and Locational Identity. Cambridge MA: MIT Press. Lefebvre, H. (1992). The Production of Space. Massachusetts: Wiley-Blackwell. Mitchell, D. (2003). The Right to the City: Social Justice and the Fight for Public Space. New York: Guilford. Ostrom, E. (1990). Governing the Commons: the Evolution of Institutions for Collective Action. Cambridge: Cambridge UP. Pinder, D. (2005). Visions of the City: Utopianism, Power and Politics in Twentieth-Century Urbanism. Edinburgh: Edinburgh University Press. Shaftoe, H. (2006). Behaving badly in public places. Urban Design, 97, 19-21. Sibley, D. (1995). Geographies of Exclusion: Society and Difference in the West. London: New York. St John, G. (2008). Protestival: Global Days of Action and Carnivalized Politics in the Present. Social Movement Studies, 7(2), 167-190. Stevens, Q. (2007). The Ludic City: Exploring the Potential of Public Spaces. New York: Routledge. Sullivan, D. & S. Shaw. (2011). White Night: Gentrification, Racial Exclusion, and Perceptions and Participation in the Arts. City & Community, 10(3), 241-264. Thompson, N., (2004). Interventionists: Users’ Manual for the Creative Disruption of Everyday Life. North Adams, MA: MASS MoCA. Tuan, Y. (1974). Topophilia: A Study of Environmental Perception, Attitudes, and Values. New York: Columbia University Press. Vaneigem, R. (1972). The Revolution of Everyday Life. Trans. J. Fullerton & P. Sieveking: Practical Paradise. Vivoni, F. (2009). Spots of Spatial Desire: Skateparks, Skateplazas, and Urban Politics. Journal of Sport & Social Issues, 33(2), 130-49. Douglas, M. (1996). Purity and Danger: An Analysis of the Concepts of Pollution and Taboo. New York: Routledge. Glassner, B. (1999). The Culture of Fear: Why Americans Are Afraid of the Wrong Things. New York: Basic Books. Harcourt, B. (2001). Illusion of Order: the False Promise of Broken Windows Policing. Cambridge, MA: Harvard UP. Sampson, R. & S. Raudenbush. (2004) Seeing Disorder: Neighborhood Stigma and the Social Construction of “Broken Windows.” Social Psychology Quarterly, 67(4), 319- 342. Steinert, H. (2003). The Indispensable Metaphor of War on Populist Politics and the Contradictions of the State‘s Monopoly of Force. Theoretical Criminology, 7(3), 265- 291.